Last weekend I decided to take advantage of the strong Canadian dollar and head cyber-South to Victoria’s Secret’s online store to spoil myself with some stylin’ sweaters. I spent over 2 hours comparing items, and shortlisted about 12. Even though VS has a wish list feature, I admit that I used the shopping bag as a holding tank for products I like. I had two good reasons for this. I had an intent to buy, not dream, and I wanted to save the hassle of transferring wish list items to the bag. After 2 hours, I needed a break and closed all my open tabs. I’ve been conditioned (or spoiled) by other online shopping experiences and I expected VS to remember my items when I came back. But alas, when I returned to Victoria’s Secret my shopping bag was empty! I fully had intention to buy multiple items (I had given myself a $350 budget), but my visit will ever be recorded by web analytics as an “Abandoned Shopping Bag.” Because the thought of starting over again is daunting, I just gave up. How could my sale have been saved? In this case, I would have come back and checked out if only my items had been held for me. Had I signed in to my account (which I happen to have from my welcome email research) there would be no problem, right? Not necessarily. About 29% of online retailers surveyed by The Etailing Group report that they don’t hold merchandise in carts (whether logged in or not). 27% hang on for 3 months, and the rest for as little as 30 minutes to indefinitely. It’s possible that I could have come back an hour later to an empty cart. Other sites like American Apparel don’t require you to be logged in at all to save items or check out. This approach combined with a longer holding period would have saved this sale. Another assumption I made was that I was logged in. I recently signed up for an account with Victoria’s Secret and expected them to remember me (I never logged out). Every user scenario is different, as is every user’s mindset. But I’m not alone. The Etailing Group surveyed 950+ experienced online consumers and found that one in three are like me and assume their schwag will be saved for them. 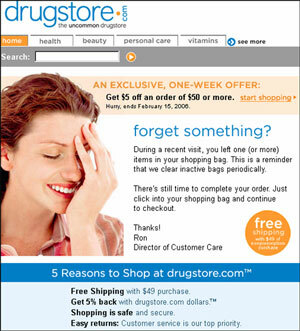 There can be many reasons for the dreaded abandoned cart — site bugs, sticker shock at checkout, difficult site registration processes, shipping destination issues, buyers remorse or maybe your “customer” is an ecommerce blogger or researcher *wink*. Regardless of the why, every online retailer wants to save as many sales as possible. Using a follow up email can be very effective, but this means you need to capture at least an email address early on in the process. tested over 100 checkout processes From August 15th to October 1st, dropping out just before completion. Follow the link and find a number of great examples of real retailers who do the follow up emails well. 2. Follow up abandoned carts with an email message. Using an image of the product in the reminder email is a bonus. 3. Send a second reminder email if the first one is not responded to with an incentive to complete the order. Ideas include offering conditional free shipping, a discount on future purchases or a gift with purchase.